To tie in with their current exhibition The House of Illustration have announced (here) a talk by comics expert Paul Gravett on 'Secrets of North and South Korean comics', tickets are from £15 (note this includes free entry to the 'Made in North Korea' exhibition, which this talk complements). In 1991, North Korea’s Kim Jong Il declared that the nation should ‘develop the comic-strip genre’. This official endorsement led to increased production of kurimch’aek or ‘picture books’, many in comics form and several adapted from the writings of the ‘Great Leader’, his first wife or their son and successor. 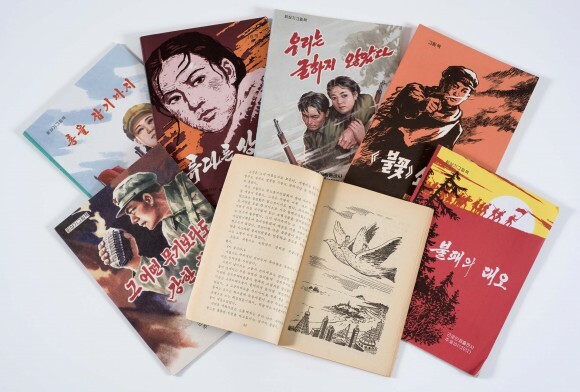 During and since the Korean War, North and South Korea have harnessed the cartoon medium for propaganda, while they also share historical folk heroes who live on in both sides of the demilitarised zone. On the other hand, modern manhwa, or comics made in South Korea, survived censorship and public burnings to earn government support and compete directly with manga from Japan. Today, South Korea's searing graphic novels can confront the traumas of history. Their phenomenally popular digital comics or webtoons can also give a voice to critical cartoon journalists and North Korean defectors.